All this, from leftovers ! 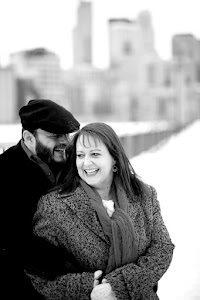 We had a fabulous dinner on Saturday night at The Lyndale Tap House, but as usual, I over ordered. So, I came home with a little leftover box of some peel and eat cajun shrimp. On Sunday, I decided we needed to use up some of the copious amounts of leftovers we had accumulated in our refrigerator over the long holiday weekend, so why not start with breakfast ? Since we had some goat cheese grits left over from the smoker extravaganza on Friday, I knew I could pair those with my leftover shrimp. Add a nice, soft, over easy egg, and it's the perfect, lazy Sunday morning breakfast ! Of course, it would be simple enough to make from scratch as well, but why bother when you have the leftovers ! Melt butter in a large, non-stick pan. Saute shrimp until just pink, then sprinkle with cajun seasoning and set aside. Heat up your leftover grits in the microwave. Use the same pan you cooked the shrimp in to cook your eggs over easy. 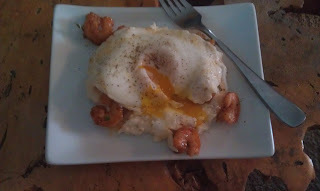 Plate grits on first, top with shrimp, then eggs, and salt and pepper to taste.